Tony Hawk's Pro Skater 5 will be making some big changes to the series' usual multiplayer. Today developer Robomodo explained how online play will work in the skateboarding game. The sessions themselves are hosted by dedicated servers, so you can drop in and out of populated Freeskate sessions at any time. When you are ready, you can jump into a mission with your party or challenge the entire park in one of the competitive multiplayer modes. This is done from the Sessions menu, a multipurpose tool for queuing up missions or modes, managing your party, and checking to see who’s in the park. 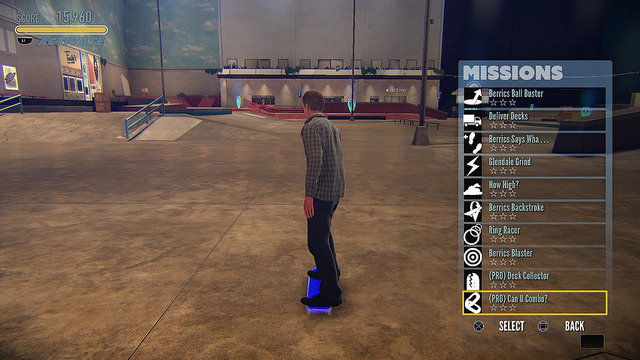 When your mission or match is finished, you can either retry/rematch or seamlessly jump back into the Freeskate where you can hang out while deciding what to do next. One important thing to reiterate about Pro Skater 5's multiplayer, though, is that it's only available on PS4 and Xbox One. Activison confirmed earlier this year that their PS3 and Xbox 360 counterparts will be single-player-only. The upside is that the last-gen versions only cost $40 instead of $60. In his PlayStation.Blog post, Tsui also revealed that the PS4 and PS3 versions of the game will get exclusive DLC. Fortunately for Xbox gamers, this exclusive content is minor. 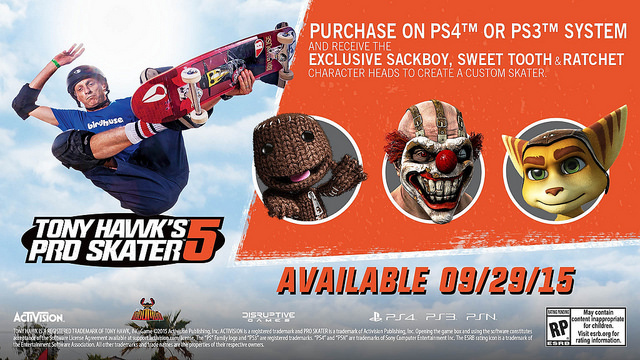 PS4 and PS3 owners will get access to Ratchet, Sweet Tooth and Sackboy heads for their custom characters. It's no surprise to see another Activision-published game with platform-exclusive DLC. The company made similar arrangements for Destiny and Call of Duty: Black Ops 3 with Sony. The PlayStation bonuses is on top of the pre-order exclusives that retailers are now offering for all versions. For example, Amazon is giving away a Hawk Skull Board while GameStop is offering a Totally Rad 80's Pack. Tony Hawk's Pro Skater 5 will debut on Xbox One and PS4 on September 29th. The Xbox 360 and PS3 versions aren't dated yet but should arrive "before the holidays" according to Tsui. Throughout the summer and fall, Robomodo will be giving players a chance to test the game in North America and Europe. They'll share additional details in the near future.